We come and pick you up from hotel in Da Nang and then start phong nha cave tour from da nang. We first transfer you via Hai Van pass – the Pass of the Ocean Clouds. The pass is pretty misty in the rainy season and it is one of the most imposing pass in Vietnam. On the way, we stop en route for you to take some pictures and from here you can have a whole view of Da Nang bay. Then we stop in a while on the top of the pass for you to take some pictures of American bunkers and brick towers built by Nguyen Dynasty. Then we lead you down hill and Lang Co beach with beautiful sandy beach is such a great place for photograph as well. From here, you will have a panoramic view of Lang Co town. How lovely Lang Co beach is in a sunny day! Following the tour by a nice drive through Lap An lagoon in Lang co town and you are ready to photograph and have a rest. Then the tour moves on as we keep driving through villages, towns and a by pass through Hue city. Next, we stop the journey at Hien Luong bridge and Ben Hai river in DMZ for you to know about the war. The river is just 100m but it witnessed the pain, the loss, the tears and huge desire of Vietnamese people about the victory. Ben Hai river divided the country in almost 20 years and we are thankful to those soldiers who have lost their lives for the independence and freedom of the country. We will stroll around the site and pay a visit to the old Hien Luong bridge, watching tower, museum and big Flag tower. Afterwards, we will have lunch in a local restaurant then we keep going to Phong Nha National Park. On arrival, take a boat cruise on Son river and admire the peace of the countryside. It is a very nice landscape because of combination between mountain, river and the mighty of the nature. Reaching the entrance, the boat will lead us to go in and we start exploring a part of the longest underground river in the world. 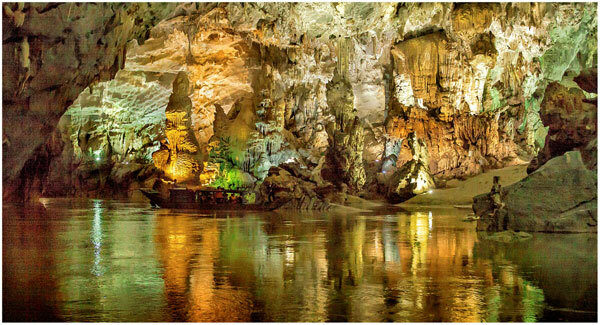 Phong Nha cave comes out with brilliant beauty, lots of stalactites and stalagmites in different figures come out featuring different shapes that no elsewhere can compare. On the way out, we walk on sand dunes and we will be absolutely amazed by the charm of this cave. Reaching out the cave, we walk up stairs to visit Tien Son cave that lies around 300m high from Phong Nha cave. The cave is a picture of amazing landscape such as you watch in a movie. Entering the cave is like you are coming to a land of fairy tale. Thousands of stalactites and stalagmites in various colors appear bring about a charm that we feel speechless to say any words. The beauty of Tien Son cave is a blessing of the nature and of eternity. After exploring the cave, we will walk back down and sail back and from here we will drop you in a hotel in Phong Nha as per your request. The tour will finish here. What does phong nha cave tour from da nang offer to you? Joining in this tour, visitors will not only admire the beauty of Hai Van pass but enjoy a really picturesque scene of Lang Co town. Visitors will find out more about the war by a visit to Ben hai river, Hien Luong bridge and by the way visit some of the war relics such as Hien Luong bridge, Ben hai river, Flag tower and so on. Besides, Phong nha cave offers visitors the mighty of mountain, forest in Phong Nha National park. Deepen yourself in the spectacular beauty of Phong Nha cave with lots of stalactites and stalagmites. Or coming to Tien Son cave with endless charm will create a special feeling for visitors. Notes: the tour is conducted in a nice, pleasant or sunny day. In case of bad weather such as storms or floods, we will not organize the tour for the customers’ safety.